A good auger will cut your planting time in half, at least, by removing the most arduous task—no more hand-digging the garden bed. It makes repetitive planting less draining and allows you more time to design and enjoy. Especially for big bulb gardens, new garden beds and lasagna planting. 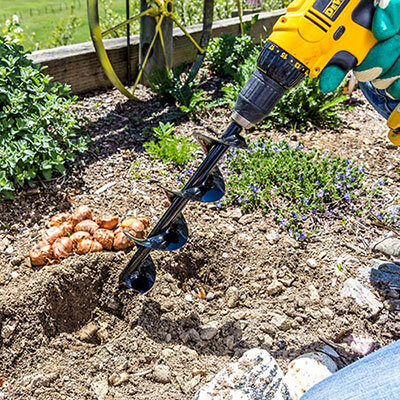 It's really a versatile tool—we also like tilling the soil in planter boxes and mixing fertilizer into soil with this auger. Our Essential Planting Auger fits on any ?" or larger drill. It makes a 5" deep hole, with an extra inch or so of loose soil that's helpful for helping roots out into the surrounding soil. It's ideal for annuals and small perennials. It's recommended for an 18V cordless drill or larger, any lower voltage drill should probably be corded, so it's not sluggish. 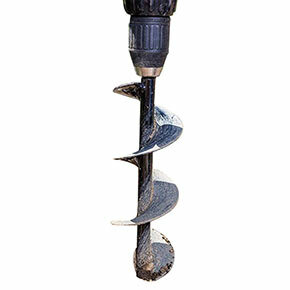 This steel auger is hand welded by a family-run manufacturer in the USA. L12"; dia. 3"